These signals are generated synchronously from an accurate and stable atomic clock frequency of 10.23 MHz, so that a military user who receives both signals can directly calibrate the ionosphere group delay and apply appropriate corrections. However, civilian users will only use the primary or L1 frequency. In the future additional civil frequencies will be implemented to also allow for real time ionosphere corrections, hence improved accuracy. NOTE: The ionospheric group delay concerns the delay effect on radio signals, which is different for different frequencies. Knowing that without an ionosphere the two frequencies would arrive at the same time, it can be calculated what the absolute influence of the ionosphere is by measuring the relative difference between the two known frequencies. Civil users using the single L1 frequency are deprived from this method and have to use modelling constants only approximating the actual ionosphere delay resulting in less accuracy. This is a short PRN (Pseudo Random Noise) code broadcast at a bit (or chipping) rate of 1.023 MHz and repeated once per millisecond (1023 bits). 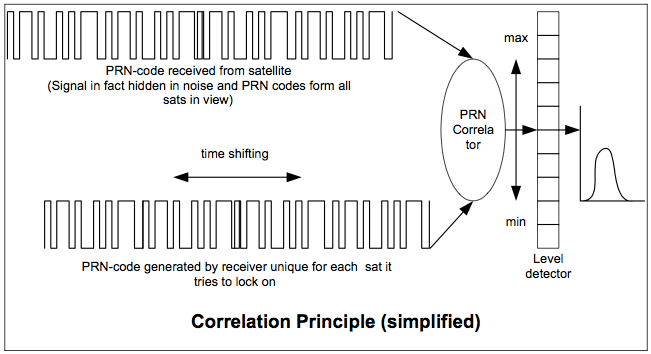 There is a different C/A code for each Satellite and their PRN number often identifies them. This is the principal civilian ranging signal, and it is always broadcast in the clear (unencrypted) way. It is also used to acquire the much longer P-code. This signal is called the SPS (Standard Positioning Service). It is always available, although it may be somewhat degraded. At this time the C/A code is available only on L1 although a second civil frequency is under development. The SPS provides predictable positioning accuracy of 100m(95%) horizontally, 195m(95%) vertically and time transfer to UTC within340ns (95%) (under specified satellite conditions). The “P” code or “Precise” code is also called the Protective code. A long PRN code of 236 x 1014 bits, a 7 day code (actually each satellite uses segments of a 266.4 day code that repeats midnight from Saturday to Sunday) that is broadcast at ten times the rate of C/A, 10.23 MHz. Because of its higher frequency, the code ranging signal is more precise. This reduces the noise in the received signal but will not improve the inaccuracies caused by biases. This signal provides the Precise Positioning Service (PPS). The military has encrypted this signal in a way that renders it unavailable to unauthorized user. This ensures that the unpredictable code (to the unauthorized user) cannot be spoofed. This feature is known as anti-spoof (AS). When encrypted (since January 31, 1994), the P code becomes the Y code. Receivers that can decrypt the Y-code are frequently called P/Y code receivers and require a classified AS module for each receiver channel. As a result of the military intent, most civilian users should only rely on the C/A code or SPS. The PPS provides predictable accuracy of 22m(95%) horizontally, 27.7m(95%) vertically and time transfer to UTC within 200ns(95%). The Navigation Message consists of time-tagged data bits marking the time of transmission of a sub- fame at the time they are transmitted by the satellite. The composition of the Navigation Message is shown in the figure. 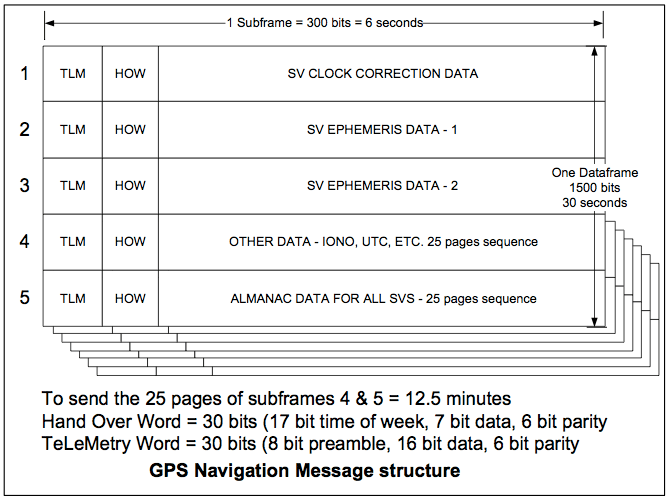 It takes 25 data-frames (125 sub-frames) to receive one complete set of the Navigation Message (12.5 minutes) from a satellite. TLM (TeLeMetry bits) provide a synchronization function. HOW (Hand Over Word) are used by the military to transition from initial Course Acquisition to P(Y) code Precise Acquisition. Signal acquisition time on receiver start-up can significantly be aided by the availability of current/stored almanacs to pre-set the receiver with the approximate position and Doppler frequency of each SV in the constellation. If last receiver position is unknown and/or the almanac is not yet available, receiver initialisation may take up to 15 minutes to reload the complete Navigation Message and solve the navigation solution. Since July 4, 1991 the military degrade the accuracy of the C/A code intentionally by dithering the satellite clock and by truncating the broadcast ephemeris. This degradation is called Selective Availability or SA. The official DOD position is that errors will be limited to 100 m horizontally. Differential GPS (explained later) can overcome this limitation and potentially provide accuracy’s sufficient for precision approach of aircraft. Anti Spoofing (AS) guards military users against fake transmissions that mimic satellite data by encrypting the P-code to form the Y-code. This encryption is considered spoof proof. To decode the Y- Code a receiver must be equipped with an Auxiliary Output Chip (AOC), The AOC is available only to authorized users. NOTE: The USA has committed to remove SA from the system before 2006. Military denial of access will then be achieved through intentional jamming of GPS signals in the area of interest while the USA military will use alternative means of satellite navigation (GPS III or Link Military). All satellites use the same radio frequencies thus the signal received is quite a melting pot of signals. However, since each satellite generates its own unique pseudo random code, these codes allow discrimination between the satellites signals. This process of isolating one satellite signal out of the melting pot is called ‘correlation’. 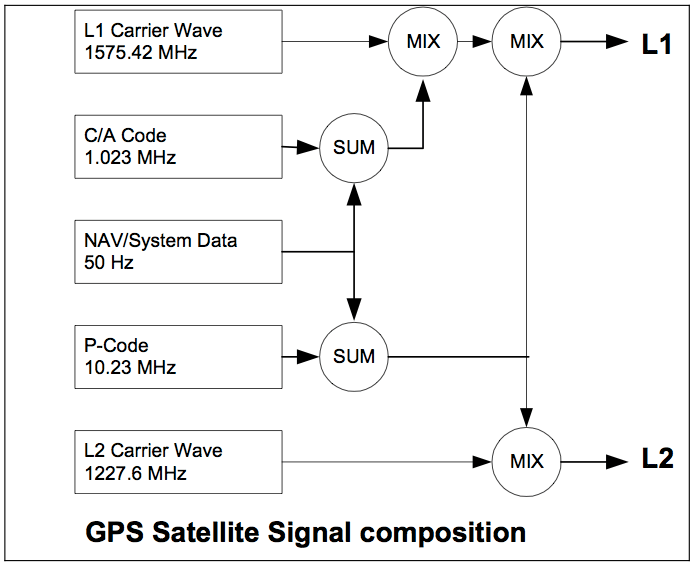 The user receiver knows the C/A code for all satellites (stored in memory or reproduced) and will try to correlate its own internally generated code with the signals received. Shifting the internal code in time the correlator output remains low as long as there is no 1:1 match with the received signals. When it finds a match, the correlator output suddenly rises substantially and lock-on is achieved. After lock-on the navigation message can be decoded from the signal and the determination of the pseudo range may begin. Initialising the receiver to its approximate position will greatly speed up this ‘trial and error’ correlation process. NOTE: In aircraft the last available (IRS) present position may be used for this initialisation process. Ultimately the receiver will also find a solution without initialisation but this may take up to 15 minutes before a navigation solution becomes available to the user. Other receivers store their last know position in memory when switched off and re-use the last stored position for initialisation. If the signal is momentarily lost ‘lock on’ is lost as well and a new correlation process is started. Momentary loss of lock may be aided by using IRS position to coast the GPS through this period and speed up re-acquisition. The signals from space arrive at a very low pica Watt level, so weak in fact they are lost below the thermal noise level (noise from electronic components due to random movement of electrons in the atoms). Superimposed on the C/A and P(Y) code there is the navigation message data at a 50 Hz rate (50 bits per second). Once lock-on is achieved the correlator output signal will swing positive and negative depending on whether the 50 Hz data bit is positive or negative. The receiver can now decode this data just like an ordinary computer and store the navigation message for this satellite in its memory. As the other satellites are ‘uncorrelated’ at this time their output signal will be near zero and will not be detected until the receiver generates and correlates the corresponding C/A code. To detect data from more than one satellite simultaneously, it is now usual to use a multi-channel receiver. For airliners 12- channel receivers are commonly used. In a relative sense the thermal noise is approximately 40 times (16dB) stronger than the C/A code and 800 times (29dB) stronger than the P(Y) code. It is the process of correlation that brings the desired signal out of the noise. In the case of the C/A code the ‘correlation gain’ is about 1000 times (30dB) and so produces a usable signal level of 25 times (14dB) larger than the noise. The gain of the P(Y) code is even higher by a factor 10 (10dB) due to the higher code rate. Some compare the weak GPS signals with the strength of a car break light seen at a distance of 2250 km. 1 dB = 10 times the (base 10) logarithm of the energy ratio, X(dB)=10log(P2/P1). The very weak GPS signals are prone to intentional (jamming) or unintentional-interference’s causing loss of GPS signals in given area’s. Also, to prevent signal loss the receiver antenna must have an unobstructed view of the satellites. Physical obstacles preventing GPS operation can be (under) water, walls, windows, buildings, structures, mountains, (under) ground, trees, etc. Simply placing a hand over the antenna of a handheld GPS receiver may demonstrate this.